With a slight rise in Initial Claims and a very weak Philly Fed number, USD/JPY fell to the bottom of the range and triggered our long order at 107.60. It’s the end of the Euro/US overlap and with no more reports set to be released for today, I am going to close the trade for a very small loss as I think negative USD sentiment will play out for the rest of the day. Close position at market (107.58) for a small loss. With the lack of any major news in the Asia and Euro trading sessions for USD/JPY, I would like to setup a simple range play for the next few hours. 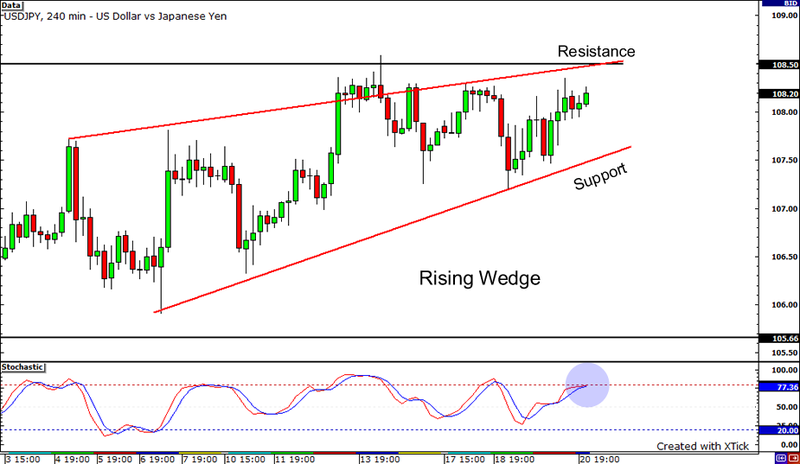 On the chart, we have a rising wedge where we may possibly run into some support and resistance action. Stochastics are trading near overbought, so I like a short around 108.50. This plays well into the interest rate cut sentiment in the US and slowing economic growth in the US. A return to the bottom or the rising trend line should prove to be a nice opportunity to join in the up trend.